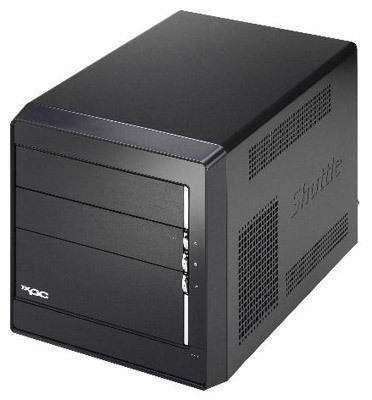 Shuttle today announced what it said is the first ever small form-factor PC chassis designed for Intel's Core 2 Duo desktop processor family. It's also the fastest machine of its kind, the company claimed. The XPC Barebone SD37P2 is fitted with a motherboard based on Intel's 975X chipset, enabling it to host a 1,066MHz frontside bus speed. The board has four memory slots to take up to 8GB of 667MHz DDR 2 SDRAM. It also has a pair of x16 PCI Express card slots ready to take two ATI CrossFire-ready graphics cards. The 32.5 x 22 x 21cm machine is equipped with on-board Gigabit Ethernet networking, 7.1-channel HD audio, ten USB ports - two at the front, six round the back and a header for two more inside the box - and a pair of FireWire ports, one at the front, one at the back. The chassis can hold three 3Gbps SATA drives connected in RAID 0, 1, 5, or 10 configurations, and contains a 400W power supply. It can take a single parallel ATA peripheral and a floppy drive.